Newswise, January 29, 2016– Older people with higher amounts of a key protein in their brains also had slower decline in their memory and thinking abilities than people with lower amounts of protein from the gene called brain-derived neurotrophic factor, or BDNF, according to a study published in the January 27, 2016, online issue of Neurology®, the medical journal of the American Academy of Neurology. “This relationship was strongest among the people with the most signs of Alzheimer’s disease pathology in their brains,” said study author Aron S. Buchman, MD, of Rush University Medical Center in Chicago and a member of the American Academy of Neurology. For the study, 535 people with an average age of 81 were followed until death, for an average of six years. They took yearly tests of their thinking and memory skills, and after death, a neurologist reviewed their records and determined whether they had dementia, some memory and thinking problems called mild cognitive impairment or no thinking and memory problems. Autopsies were conducted on their brains after death, and the amount of protein from BDNF gene expression in the brain was then measured. The participants were part of the Rush Memory and Aging Project and the Religious Orders Study. The rate of cognitive decline was about 50 percent slower for those in the highest 10 percent of protein from BDNF gene expression compared to the lowest 10 percent. The effect of plaques and tangles in the brain on cognitive decline was reduced for people with high levels of BDNF. In the people with the highest amount of Alzheimer’s disease hallmarks in their brains, cognitive decline was about 40 percent slower for people with the highest amount of protein from BDNF gene expression compared to those with the lowest amount. On average, thinking and memory skills declined by about 0.10 units per year on the tests. Higher levels of protein from BDNF gene expression reduced the effect of plaques and tangles in the brain on cognitive decline by 0.02 units per year. The researchers found that the plaques and tangles in the brain accounted for 27 percent of the variation in cognitive decline, demographics accounted for 3 percent and BDNF accounted for 2 percent. Michal Schnaider Beeri, PhD, of the Icahn School of Medicine at Mount Sinai in New York, noted in an accompanying editorial that exercise has been shown to increase levels of BDNF in the blood, but that the relationship between BDNF protein levels in the blood and in the brain is not clear. “More research is needed to confirm these findings, determine how this relationship between protein produced by BDNF gene expression and cognitive decline works and see if any strategies can be used to increase BDNF in the brain to protect or slow the rate of cognitive decline,” said Buchman. 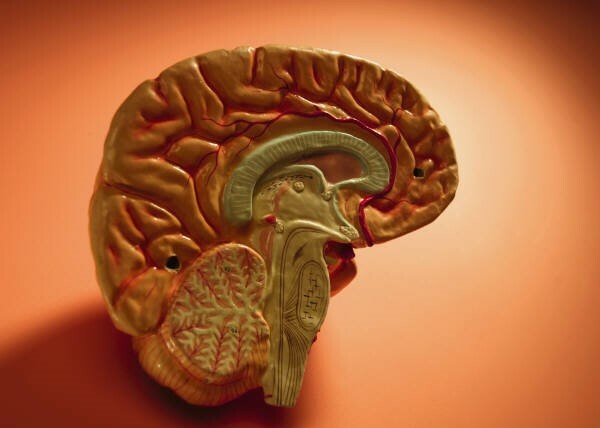 Buchman noted that the study does not prove that BDNF is the cause of a slower rate of cognitive decline; further work is needed to determine if activities which increase brain BDNF gene expression levels protect or slow the rate of cognitive decline in old age. The study was supported by the National Institutes of Health, Illinois Department of Public Health and the Robert C. Borwell Endowment Fund. To learn more about Alzheimer’s disease, please visit www.aan.com/patients. 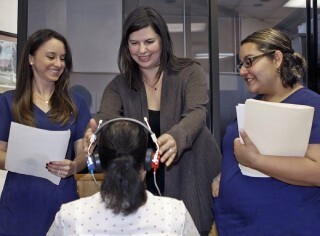 Newswise, January 29, 2016 — A recent study by Jamie Desjardins, Ph.D., an assistant professor in the speech-language pathology program at The University of Texas at El Paso, found that hearing aids improve brain function in persons with hearing loss. Hearing loss, if left untreated, can lead to serious emotional and social consequences, reduced job performance and diminished quality of life. Untreated hearing loss also can interfere with cognitive abilities because so much effort is put toward understanding speech. As people age, basic cognitive skills – working memory, the ability to pay attention to a speaker in a noisy environment, or the ability to process information quickly – begin to decline. Desjardins studied a group of individuals in their 50s and 60s with bilateral sensorineural hearing loss who had previously never used hearing aids. They took cognitive tests to measure their working memory, selective attention and processing speed abilities prior to and after using the hearing aids. After two weeks of hearing aid use, tests revealed an increase in percent scores for recalling words in working memory and selective attention tests, and the processing speed at which participants selected the correct response was faster. By the end of the study, participants had exhibited significant improvement in their cognitive function. “Most people will experience hearing loss in their lifetime,” said Desjardins, who joined UTEP in 2013. “Think about somebody who is still working and they’re not wearing hearing aids and they are spending so much of their brainpower just trying to focus on listening. Hearing loss affects more than 9 million Americans over the age of 65 and 10 million Americans ages 45 to 64, but only about 20 percent of people who actually need hearing aids wear them, Desjardins said. Desjardins’ new study focuses on the use of hearing aids by Hispanics. Research shows that only five percent of Mexican-Americans wear hearing aids. She has developed a survey to investigate their attitudes toward hearing loss. The survey will be conducted at health fairs in the community, including the Mexican Consulate in El Paso, Texas. Desjardins also will begin work on another study that will look at older bilingual people and their ability to understand speech. Newswise, January 27, 2016—Salk researchers and collaborators have achieved critical insight into the size of neural connections, putting the memory capacity of the brain far higher than common estimates. The new work also answers a longstanding question as to how the brain is so energy efficient and could help engineers build computers that are incredibly powerful but also conserve energy. “This is a real bombshell in the field of neuroscience,” says Terry Sejnowski, Salk professor and co-senior author of the paper, which was published in eLife. “We discovered the key to unlocking the design principle for how hippocampal neurons function with low energy but high computation power. Our memories and thoughts are the result of patterns of electrical and chemical activity in the brain. A key part of the activity happens when branches of neurons, much like electrical wire, interact at certain junctions, known as synapses. An output ‘wire’ (an axon) from one neuron connects to an input ‘wire’ (a dendrite) of a second neuron. Signals travel across the synapse as chemicals called neurotransmitters to tell the receiving neuron whether to convey an electrical signal to other neurons. Each neuron can have thousands of these synapses with thousands of other neurons. “When we first reconstructed every dendrite, axon, glial process, and synapse from a volume of hippocampus the size of a single red blood cell, we were somewhat bewildered by the complexity and diversity amongst the synapses,” says Kristen Harris, co-senior author of the work and professor of neuroscience at the University of Texas, Austin. Synapses are still a mystery, though their dysfunction can cause a range of neurological diseases. Larger synapses—with more surface area and vesicles of neurotransmitters—are stronger, making them more likely to activate their surrounding neurons than medium or small synapses. The Salk team, while building a 3D reconstruction of rat hippocampus tissue (the memory center of the brain), noticed something unusual. In some cases, a single axon from one neuron formed two synapses reaching out to a single dendrite of a second neuron, signifying that the first neuron seemed to be sending a duplicate message to the receiving neuron. At first, the researchers didn’t think much of this duplicity, which occurs about 10 percent of the time in the hippocampus. But Tom Bartol, a Salk staff scientist, had an idea: if they could measure the difference between two very similar synapses such as these, they might glean insight into synaptic sizes, which so far had only been classified in the field as small, medium and large. To do this, researchers used advanced microscopy and computational algorithms they had developed to image rat brains and reconstruct the connectivity, shapes, volumes and surface area of the brain tissue down to a nanomolecular level. The scientists expected the synapses would be roughly similar in size, but were surprised to discover the synapses were nearly identical. “We were amazed to find that the difference in the sizes of the pairs of synapses were very small, on average, only about eight percent different in size. No one thought it would be such a small difference. This was a curveball from nature,” says Bartol. Because the memory capacity of neurons is dependent upon synapse size, this eight percent difference turned out to be a key number the team could then plug into their algorithmic models of the brain to measure how much information could potentially be stored in synaptic connections. It was known before that the range in sizes between the smallest and largest synapses was a factor of 60 and that most are small. But armed with the knowledge that synapses of all sizes could vary in increments as little as eight percent between sizes within a factor of 60, the team determined there could be about 26 categories of sizes of synapses, rather than just a few. “Our data suggests there are 10 times more discrete sizes of synapses than previously thought,” says Bartol. In computer terms, 26 sizes of synapses correspond to about 4.7 “bits” of information. Previously, it was thought that the brain was capable of just one to two bits for short and long memory storage in the hippocampus. “This is roughly an order of magnitude of precision more than anyone has ever imagined,” says Sejnowski. What makes this precision puzzling is that hippocampal synapses are notoriously unreliable. When a signal travels from one neuron to another, it typically activates that second neuron only 10 to 20 percent of the time. “We had often wondered how the remarkable precision of the brain can come out of such unreliable synapses,” says Bartol. One answer, it seems, is in the constant adjustment of synapses, averaging out their success and failure rates over time. The team used their new data and a statistical model to find out how many signals it would take a pair of synapses to get to that eight percent difference. The researchers calculated that for the smallest synapses, about 1,500 events cause a change in their size/ability (20 minutes) and for the largest synapses, only a couple hundred signaling events (1 to 2 minutes) cause a change. “This means that every 2 or 20 minutes, your synapses are going up or down to the next size. The synapses are adjusting themselves according to the signals they receive,” says Bartol. “Our prior work had hinted at the possibility that spines and axons that synapse together would be similar in size, but the reality of the precision is truly remarkable and lays the foundation for whole new ways to think about brains and computers,” says Harris. “The work resulting from this collaboration has opened a new chapter in the search for learning and memory mechanisms.” Harris adds that the findings suggest more questions to explore, for example, if similar rules apply for synapses in other regions of the brain and how those rules differ during development and as synapses change during the initial stages of learning. The findings also offer a valuable explanation for the brain’s surprising efficiency. The waking adult brain generates only about 20 watts of continuous power—as much as a very dim light bulb. The Salk discovery could help computer scientists build ultraprecise, but energy-efficient, computers, particularly ones that employ “deep learning” and artificial neural nets—techniques capable of sophisticated learning and analysis, such as speech, object recognition and translation. Other authors on the paper were Cailey Bromer of the Salk Institute; Justin Kinney of the McGovern Institute for Brain Research; and Michael A. Chirillo and Jennifer N. Bourne of the University of Texas, Austin. The work was supported by the NIH and the Howard Hughes Medical Institute. Newswise, January 27, 2016 – A new study published in the online journal, Public Library of Science One (PLOS One) found that Vitamin B12 levels in the brain are significantly decreased in the elderly and are much lower in individuals with autism or schizophrenia, as compared to their peers at similar ages. For example, children with autism under the age of 10 were found to have three times lower brain B12 levels, which is similar to levels for generally healthy adults in their 50s, indicating a premature decrease. The international research team led by Richard Deth, Ph.D., professor of pharmacology at Nova Southeastern University’s (NSU) College of Pharmacy, analyzed tissue from otherwise healthy deceased donors along with tissue from donors who had autism or schizophrenia to make the comparisons. “These are particularly significant findings because the differences we found in brain B12 with aging, autism and schizophrenia are not seen in the blood, which is where B12 levels are usually measured.” said Dr. Deth. The study also found healthy elderly people in the age range of 61-80 have about three times lower levels of total brain B12 than younger age groups, which is a result of normal aging. This normal decrease may help adjust brain metabolism to sustain its function across the lifespan. An active form of B12 called methylcobalamin, or methyl B12, supports normal brain development by its control through a process known as epigenetic regulation of gene expression. Remarkably, the brain level of methyl B12 was found to be more than 10 times lower in healthy elderly people than in healthy younger people. A lower than normal level of methyl B12 in the brain could adversely affect neurodevelopment in younger years and could disrupt learning and memory later in life. Both autism and schizophrenia are associated with oxidative stress, which also plays an important role in aging, and oxidative stress may underlie the decreased brain B12 levels observed in this study. The findings suggest the need for further research to determine if the use of supplemental methyl B12 and antioxidants like glutathione could help prevent oxidative stress and be useful in treating these conditions. The research team consisted of Dr. Deth; Yiting Zhang (Northeastern University); Nathaniel Hodgson (Harvard University); Malav S. Trivedi (Nova Southeastern University); Hamid Abdolmaleky (Boston University); and Margot Fournier, Michel Cuenod and Kim Quang Do (Lausanne University, Switzerland). Research reported in this press release was supported by the Autism Research Institute. Newswise, January 27, 2016 — Nearly 15 percent of patients diagnosed with colorectal cancer were younger than 50, the age at which screening recommendations begin. The study by researchers at the University of Michigan Comprehensive Cancer Center also found that younger patients were more likely to have advanced disease. The authors suggest this is in part because they are diagnosed only after their cancers have grown large enough to cause symptoms. “Colorectal cancer has traditionally been thought of as a disease of the elderly. This study is really a wake-up call to the medical community that a relatively large number of colorectal cancers are occurring in people under 50,” says study author Samantha Hendren, M.D., M.P.H., associate professor of surgery at the University of Michigan Medical School. “To put this in context, breast cancer screening often begins at age 40, and less than 5 percent of invasive breast cancers occur in women under that age. Our study found that about 15 percent of colorectal cancers are diagnosed before the screening age of 50,” she adds. The study identified 258,024 patients diagnosed with colon or rectal cancer from the Surveillance, Epidemiology and End Results database, a national database of cancer incidence. Results appear in the journal Cancer. The authors found that younger patients were more likely to receive aggressive surgery and radiation therapy. In addition, this group had better survival rates, both overall and by stage. Among patients whose cancer had spread to distant organs, 21 percent of younger patients survived beyond five years, compared to 14 percent of older patients. The improved survival could be in part due to the more aggressive treatment, the authors suggest. The findings suggest the need for more awareness of warning signs of colorectal cancer: anemia, a dramatic change in the size or frequency of bowel movements, and bleeding with bowel movements. The authors also say that more people need to consider family history of colorectal cancer, which is a significant risk factor. 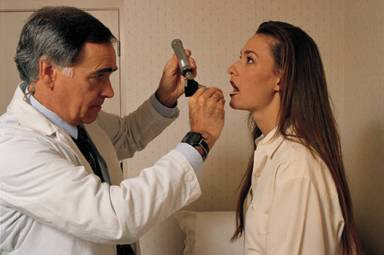 Should guidelines change to begin screening at an earlier age? Hendren says not so fast. Meanwhile, the more aggressive treatment and longer survival for younger patients suggest the need to improve long-term survivorship resources. “The cancer community needs to prepare for the increasing number of very young colorectal cancer survivors who will need long-term support to cope with the physical and psychological consequences of their disease and treatments,” Hendren says. Newswise, January 27, 2016— Expanding lung cancer screening to include people who quit smoking more than 15 years ago could detect more cases and further reduce associated mortality, according to a study by Mayo Clinic researchers published in the Journal of Thoracic Oncology. “A decline in smoking rates has been, and continues to be, a critical step to reduce lung cancer risk and deaths,” says the study’s lead author Ping Yang, M.D., Ph.D., an epidemiologist at Mayo Clinic Cancer Center. The current lung cancer screening criteria set by the U.S. Preventive Services Task Force (USPSTF) recommends CT screening for adults between the ages of 55 and 80 who have smoked at least one pack a day for 30 years and are still smoking, or have quit within 15 years. In the current study, Dr. Yang and her colleagues set out to identify which specific populations of individuals are at risk, but are being missed by the current lung cancer screening criteria. Researchers retrospectively tracked two groups of people with lung cancer: a hospital cohort made up of 5,988 individuals referred to Mayo Clinic and a community cohort consisting of 850 residents of Olmsted County, Minnesota. They found that, compared to other risk categories, patients who quit smoking for 15 to 30 years accounted for the greatest percentage of patients with lung cancer who didn’t qualify for screening. The newly defined high-risk group constituted 12 percent of the hospital cohort and 17 percent of the community cohort. “We were surprised to find that the incidence of lung cancer was proportionally higher in this subgroup, compared to other subgroups of former cigarette smokers,” says Dr. Yang. “The common assumption is that after a person has quit for so many years, the lung cancer rate would be so low that it wouldn’t be noticeable. We found that assumption to be wrong. Equally important, the current study found that expanding the criteria for CT screening would not significantly add to the number of false-positive cases and would save more lives with an acceptable amount of radiation exposure and cost. Dr. Yang and her colleagues showed that expanding the criteria to include this risk category could add 19 percent more CT examinations for detecting 16 percent more cases. They calculated the expansion would result in minimal increases in false-positive results (0.6 percent), over diagnosis (0.1 percent), and radiation-related lung cancer deaths (4 percent). "Lung cancer rates are dropping, because smoking is decreasing, but that doesn’t mean that our current screening parameters are good enough,” Dr. Yang says. “It is understandable, because the relative importance of risk factors changes over time. We need to adjust screening criteria periodically, so we can catch more lung cancers in a timely fashion. She recommends additional research to confirm if similar trends are being seen in populations beyond Olmsted County Minnesota. If confirmed, she recommends that policymakers consider changing the lung cancer screening guidelines to include people who quit smoking more than 15 years ago. She also recommends that policymakers continue to re-examine lung cancer screening criteria to account for changes in groups that are most at risk. Newswise, January 27, 2016 — Two home visits by a physician’s assistant (PA) during the week after hospital discharge significantly reduces the chance that a heart surgery patient will be readmitted, and reduces overall costs associated with the heart surgery, according to a scientific presentation at the 52nd Annual Meeting of The Society of Thoracic Surgeons. Dr. Nabagiez and colleagues analyzed hospital readmission rates of 1,185 patients who underwent cardiac surgery from September 2008 through August 2012 at Staten Island University Hospital in New York. Patients were divided into those who received home visits and those who did not receive visits (control group). Readmission rates, lengths of stay, and healthcare costs were compared between the two groups. The patients who received visits from PAs on days 2 and 5 following hospital discharge had a significantly lower rate of readmission (10%) compared with those who did not receive home visits (17%). This represents a 41% reduction in the rate of readmission within the first 30 days following cardiac surgery. “The physician’s assistants who made the house calls in our study were fully trained cardiac surgery PAs who were actively involved in the preoperative, intra-operative, and postoperative care of our patients,” said Dr. Nabagiez. The analysis also showed an overall reduction in healthcare expenditures during the course of the study. It cost $23,500 to make house calls to 363 patients, which saved $977,500 in readmission costs. This translated to $39 in healthcare savings for every $1 spent. “It is essential for patients to comply with all prescribed medications and physical rehabilitation after heart surgery, and two house calls in the first week after discharge helped patients remain focused on these goals,” said Dr. Nabagiez. Note: One co-author disclosed a commercial relationship as Speakers Bureau/Honoraria, Medtronic Inc.
For a copy of the abstract, “Cost Analysis of a Physician Assistant Home Visit Program to Reduce Readmissions Following Cardiac Surgery,” contact Cassie McNulty at 312-202-5865 or cmcnulty@sts.org. Founded in 1964, The Society of Thoracic Surgeons is a not-for-profit organization representing more than 7,100 cardiothoracic surgeons, researchers, and allied health care professionals worldwide who are dedicated to ensuring the best possible outcomes for surgeries of the heart, lung, and esophagus, as well as other surgical procedures within the chest. The Society’s mission is to enhance the ability of cardiothoracic surgeons to provide the highest quality patient care through education, research, and advocacy. Newswise, January 21, 2016 — Winter precipitation can bring an increased risk for slips and falls on the ice and snow. Julia Henderson-Kalb, M.S., OTR/L an instructor in the Department of Occupational Science and Occupational Therapy at Saint Louis University, recommends some simple steps to minimize fall risk. Safety begins before you leave the house. Shoe choice can impact stability. Henderson-Kalb recommends avoiding boots or shoes with smooth soles or heels. Instead, wear shoes or boots that provide traction on snow and ice; boots made of non-slip rubber or neoprene with grooved soles are best. A heavy, bulky coat that will cushion you if you should fall is also a wise idea, Henderson-Kalb said. In addition to keeping your line of vision clear, it is important to remember to not overdo it. While it may be tempting to grab all your groceries in one load to more quickly escape the cold, it could impact your stability. Extending your arms out to your sides can help to maintain balance. Look ahead when you walk. 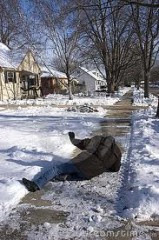 Walking along the grassy edge of snow- or ice-covered sidewalks or driveways provides better traction. Use hand railings when walking on steps. In addition to planning for weather-related delays in traffic, taking your time on foot is also a good idea. What happens if you do find yourself slipping? * Anytime you are walking on possibly slick surfaces, keep your hands out of your coat pockets. This lowers your center of gravity while walking and increases balance. “You can help break your fall with your hands free if you do start to slip, although this does increase the risk of a wrist injury. * If you fall backwards, quickly tuck your head forward, chin to chest. Try to extend your arms away from your body and “slap” the ground with your palms and forearms. This maneuver will help prevent your head, wrists and elbows from hitting the ground. * If you fall to the side, try to allow your forearm to make contact with the ground first, not your hand. Lift your head to the opposite shoulder and continue to roll. * If you fall forward, try to roll to one side, and follow the same procedure as if you were falling to the side. If you do fall, the first thing to do is assess yourself for injuries. If you have struck your head or you think you have broken a bone, attempt to get help before moving. If you think you are uninjured, go ahead and try to get up. “If you have not hit your head, it is helpful to get off the cold surface rather than staying on it,” Henderson-Kalb said. She recommends turning over onto your hands and knees. Take one foot and place it between your hands, then bring the other foot between your hands. Trying to keep feet shoulder width apart, push yourself up from there. The bottom line on walking in snowy and icy conditions is be prepared, be aware and be careful. Long a leader in educating health professionals, Saint Louis University offered its first degree in an allied health profession in 1929. Today the Doisy College of Health Sciences offers degrees in physical therapy, athletic training education, clinical laboratory science, nutrition and dietetics, health informatics and information management, health sciences, medical imaging and radiation therapeutics, occupational science and occupational therapy, and physician assistant education. The college's unique curriculum prepares students to work with health professionals from all disciplines to ensure the best possible patient care. Newswise, January 21, 2016– Bradycardia – a slower than normal heartbeat – does not increase the risk of developing cardiovascular disease, according to a study conducted by researchers at Wake Forest Baptist Medical Center. The study is published in the Jan.19 online edition of the Journal of American Medical Association Internal Medicine. “For a large majority of people with a heart rate in the 40s or 50s who have no symptoms, the prognosis is very good,” said Ajay Dharod, M.D., instructor in internal medicine at Wake Forest Baptist and corresponding author of the study. The heart usually beats between 60 and 100 times a minute in an adult at rest. But with bradycardia, the heart beats fewer than 50 times a minute. The condition can cause light-headedness, shortness of breath, fainting or chest pain due to the heart not pumping enough oxygen-rich blood through the body. However, until now, there had not been any research to determine if a slow heart rate contributed to the development of cardiovascular disease. In the Wake Forest Baptist study, the scientists conducted an analysis of 6,733 participants in the Multi-Ethnic Study of Atherosclerosis (MESA). This study, which was sponsored by the National Heart Lung and Blood Institute, included men and women ages 45 to 84 who did not have cardiovascular disease when first recruited into this study, but who may have been on heart rate-modifying medications frequently used to treat hypertension. Study participants were followed for more than 10 years to monitor cardiovascular events and mortality. The researchers found that a heart rate (HR) of less than 50 was not associated with an elevated risk of cardiovascular disease in participants regardless of whether they were taking HR-modifying drugs, such as beta blockers and calcium channel blockers. However, the study did show a potential association between bradycardia and higher mortality rates in individuals taking HR-modifying drugs. This research was supported by contracts N01-HC-95159, N01-HC-95160, N01-HC-95161,N01-HC-95162, N01-HC-95163, N01-HC-95164, N01-HV-95165, N01-HC-95166, N01-HC-95167, N01-HC-95168 and N01-HC-95169 from the National Heart, Lung, and Blood Institute and by grants UL1-TR-000040 and UL1-TR-001079 from NCRR. Co-authors include Elsayed Z. Soliman, M.D., Farah Dawood, M.D., Haiying Chen, M.D., Ph.D., and Alain G. Bertoni, M.D., of Wake Forest Baptist; Steven Shea, M.D., of Columbia University; and Saman Nazarian, M.D., Ph.D., of Johns Hopkins Health System. Newswise, January 21, 2016 — Researchers long have known that some portion of the risk of developing cancer is hereditary and that inherited genetic errors are very important in some tumors but much less so in others. The study, from Washington University School of Medicine in St. Louis, appears in the journal Nature Communications. Past genomic studies of cancer compared sequencing data from patients’ healthy tissue and the same patients’ tumors. These studies uncovered mutations present in the tumors, helping researchers identify important genes that likely play roles in cancer. But this type of analysis can’t distinguish between inherited mutations present at birth and mutations acquired over the lifespan. If one copy of one of these genes from one parent is already mutated at birth, the second normal copy from the other parent often can compensate for the defect. But individuals with such mutations are more susceptible to a so-called “second hit.” As they age, they are at higher risk of developing mutations in the remaining normal copy of the gene. “We looked for germline mutations in the tumor,” Ding said. “We also found a significant number of germline truncations in the BRCA1 and BRCA2 genes present in tumor types other than breast cancer, including stomach and prostate cancers, for example,” Ding said. Genetic testing of the BRCA1 and BRCA2 genes in women at risk of breast cancer can reveal extremely useful information for prevention. When, for example, the genes are shown to be normal, there is no elevated genetic risk of breast cancer. But if either of these genes is mutated in ways that are known to disable either gene, breast cancer risk is dramatically increased. In this situation, doctors and genetic counselors can help women navigate the options available for reducing that risk. For each mutation, they tested how well the BRCA1 protein could perform one of its key DNA-repair functions. The researchers found that six of the mutations behaved like truncations, disabling the gene completely. These mutations also were enriched in the tumors, supporting a likely role in cancer. Newswise January 11, 2016 – Taking a high dose of vitamin D3 is safe for people with multiple sclerosis (MS) and may correct the body’s hyperactive immune response, according to a study published in the December 30, 2015, online issue of Neurology®, the medical journal of the American Academy of Neurology. Low levels of vitamin D in the blood are tied to an increased risk of developing MS. People who have MS and low levels of vitamin D are more likely to have greater disability and more disease activity. For the study, 40 people with relapsing-remitting MS received either 10,400 IU or 800 IU of vitamin D3 supplements per day for six months. 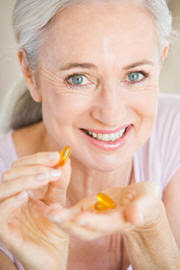 The current recommended daily allowance of vitamin D3 is 600 IU. Blood tests at the start of the study and again at three and six months measured the amount of vitamin D in the blood and the response in the immune system’s T cells, which play a key role in MS.
Side effects from the vitamin supplements were minor and were not different between the people taking the high dose and the people taking the low dose. One person in each group had a relapse of disease activity. The people taking the high dose had a reduction in the percentage of T cells related to MS activity. When the increase in vitamin D in the blood was greater than 18 nanograms per milliliter (ng/ml), every 5 ng/ml increase in vitamin D led to a 1 percent decrease in the percentage of interleukin 17 T cells in the blood. The people taking the low dose did not have any changes in their T cells. While researchers are still determining the optimal level of vitamin D in the blood for people with MS, the people in the study taking the high dose of vitamin D reached a level that has been proposed as a target for people with MS. Vitamin D levels above 30 ng/ml are considered sufficient for the general population, but researchers noted that for people with MS, it may be that levels above 50 ng/ml are necessary to reduce disease activity. The group taking the low dose did not reach this target. The study was supported by the Kenneth and Claudia Silverman Family Foundation, Montel Williams Foundation and National Multiple Sclerosis Society. To learn more about multiple sclerosis, please visit www.aan.com/patients. MD and NP applaud steps to define the concept of primary care in JAGS co-authored editorial; call for better data, measures to help achieve best outcomes for older adults with chronic illnesses. Newswise, January 11, 2016 — There is an ongoing national debate, heated at times, amongst health professionals concerning nurse practitioners (NPs) taking on the role of primary care physicians (MDs). An increasing number of states have been allowing NPs with advanced degrees to practice without the direct oversight of an MD, effectively allowing NPs to be the sole provider of primary care. Such legislation has been the response to a general shortage of primary care physicians, especially in rural areas. In a recent issue of the Journal of the American Geriatrics Society (JAGS) [Vol. 63, #10, October 2015], the lead article, “Diabetes Mellitus Care Provided by Nurse Practitioners vs Primary Care Physicians,” by Yong-Fang Kuo, PhD, compares processes and cost of care among older diabetes patients cared for by NPs versus MDs in a retrospective cohort study. Alongside the study, JAGS’ editors also chose to publish a commentary editorial entitled “The Eye of the Beholder,” authored by Dr. Robert Kane, MD, School of Public Health, University of Minnesota, and Eileen M. Sullivan-Marx, PhD, RN, College of Nursing, New York University. Kuo and his colleagues, utilized data from patients with a diagnosis of diabetes in 2009 (n=64,354) who received all their primary care from NPs or MDs, selected from a national sample of Medicare beneficiaries. They concluded that compared to MDs, NPs were either similar or slightly lower in their rates of diabetes guideline concordant care. NPs used specialist consultations more often but had similar overall costs of care to MDs. Dr. Kane and Sullivan-Marx note that the Kuo study limits the definition of “primary care provider” by stipulating that care be provided by only one type of practitioner. Dr. Kane and Sullivan-Marx stress that the concept of primary care remains elusive, but not unattainable. “Efforts to use the best available administrative data to identify processes and outcomes of primary care have been frustrating, particularly so for older adults with complex chronic illnesses,” admitted Sullivan-Marx. “Sadly, the range of concerns underlying today’s concept of coordinated, continuous, comprehensive primary care gets lost on specialists, who too often are delivering the bulk of the care to many older people.” said Dr. Kane.